Mission Statement: Empowered by the Holy Spirit, RiZen strives to present a music ministry to both believers and seekers which glorifies the Lord. By using their musical gifts and ability to perform, they will present the Gospel, in such a way as to encourage, strengthen believers' faith and walk with the Lord and to draw seekers toward the way, the truth and the light, Jesus Christ. Adriann and Aundrea Lewis, Kanika Trigg, and Ashley Jones, introduced as the "anointed women of God," are the members of this "retro gospel girl group" who's Gospel music is built on the solid foundation of traditional Gospel music, with a healthy shot of R & B, all stirred together with RiZen's own outstanding musical interpretation of Gospel music. This results in creating a sound that both pays tribute to traditional Gospel and brings Gospel music into the 21st century with a powerful, joyful, inspiring bang. Adriann and Aundrea Lewis, Kanika Trigg and Ashley Jones are very talented young women, anointed by the Lord to use their musical gifts and ability to perform so effectively to present the Gospel to encourage, strengthen believers' faith and walk with the Lord and to draw seekers toward the way, the truth and the light, Jesus Christ. All four members of RiZen were born and raised in Michigan. Adriann and Aundrea Lewis are the daughters of Pastor Luciose Lewis, and have been involved with Gospel music from a very young age. Their singing talent was "carefully and lovingly nurtured by their mother, Kayron Lewis In the Lewis home growing up, Adriann, Aundrea and their brother, AyRon, who is now a Gospel song writer, became very familiar with the music and spiritual inspiration of such Gospel artists as Shirley Caesar, Albertina Walker, Dorothy Norwood and James Cleveland, as well as a variety of R & B artists as well. Adriann explains how these early musical influences and experiences have affected their music now. "Our parents let us listen to R& B because they knew we loved the music. That was a great thing, because I know those influences contributed to our diversity as singers as we were growing up. But there's no doubt about it, that classic gospel is in our blood, and what we love to sing the most." Because of their God-given talents in music, both sisters were led to perform from an early age. Adriann sang her first solo in church at the age of three, while standing on a wooden box in the pulpit so everyone could see her. Aundrea grew up singing in the church choir as well and later became the director of the choir. In the '90's she was a soloist with the formation of RiZen, which originally started off with eight members in 1996. Different expectations of various members caused some friction and the group never had peace. One by one people dropped out until the group had shrunken down to just three women; Adriann, Aundrea and Kanika Trigg, who is a very good friend of Adriann, had joined RiZen soon after joining Pastor Lewis's church. This was a low point of discouragement, which caused Adriann to question a little if this was the path that the Lord was calling them to go down. But, bolstered by prayer and faith, they carried on with determination. Adriann comments, "There were times when I really began to doubt if this was really what God was calling me to do, but we were still determined to go on. And we're seeing the blessings He's brought to us now. Like they say, the Lord may not be there with what you think you need, when you think you need it, but He's always right on time." About four years ago, Ashley Jones became the fourth member of RiZen after auditioning for the soprano spot in the group. With the right chemistry, having full hearts for the Lord, empowered by the Holy Spirit and supported by their church community, their musical talents gelded together, creating their own very unique, energetic brand of Gospel music that stirs the soul, lifts the spirits and brings the gospel of Jesus Christ to life. Principle producer of their new CD, Sanchez Harley comments on their collective talent and appeal. "Before we began this project, I sat in on one of RiZen's rehearsals, and was just blown away at the degree of development in both their talent and material. I knew right away that this was something very special that would bless a lot of people." Legendary Sanchez Harley, co-producer of RiZen's Debut CD, has this to say about their music. "RiZen has very strong church roots, and a strong traditional influence in their music, but there are also a lot of diverse influences you can hear in what they do. Rock, R & B, pop ballads are all part of the mix, with a very high energy level throughout, and it uniquely positions them to reach audiences that are both older and younger, traditional and contemporary. I think this album is a fusion of a broad range of Gospel music that covers a lot of genres and eras." Needless to say, "their amazing sound of their dynamic Gospel music and electrifying stage presence has created a buzz throughout the industry." 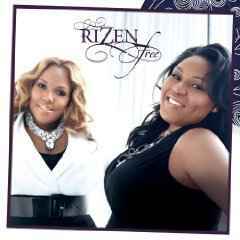 RiZen has performed with gospel legends Beverly Crawford, Shirley Caesar, Dr. Bobby Jones and Albertina Walker. They have already been featured on Dr. Bobby Jones Gospel Show and performed at the Annual Gospel Music Workshop of America’s Board Meeting earlier this year. 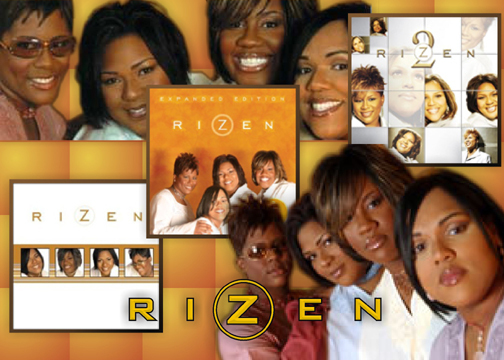 RiZen was named the winner of the “New Artist Spotlight” at the 2003 CBA Retailers Choice Awards, sponsored by Christian Retailing magazine and held during the 2003 Christian Booksellers Association International Convention. This award is given to “a new group or performer who shows incredible talent and promise and is sure to be one to keep your eye on in the future.” RiZen’s performance during the awards program had the industry crowd dancing and was considered by many to be a highlight of the evening." 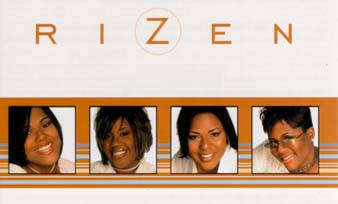 Vickie Winans says of the group, “RiZen is a surprisingly powerful and refreshing addition to gospel music. They are the type of group that stands out among the pack! These girls will take you to church! They are explosive and compelling on the stage." “Wow! I cannot remember the last time a group has affected me like RiZen,” commented Joyce Martin McCollough of The Martins, who also performed during the event. “Their beautiful smiles were contagious and the anointing was so strong, it was electric. Their strong voices and choreography brought the music alive and made me want to dance. As a matter of fact, I did dance! I am a huge fan of these girls and cannot wait to hear how God is going to bless their ministry." Their Special Unique Style of Gospel Music have been a huge blessing of hope and strength in Jesus to others because of their high energy, heartfelt presentation of the message and unique blend of different sounds of traditional church Gospel, Rock, R & B and Pop. This powerful combination of music and message reaches out to a wide range of people, in a very exciting, energetic style which has together been known to blow the roof off and the doors open, having the effect of replacing the negativity, discouragement and self-pity many have in their lives with the upbeat Hope, Faithfulness, and Love we have in our Lord Jesus Christ, through whom believers have many promises to hold them up and to look forward to, one of them being eternal life in the heavenly city with Jesus. Co-producer -- Sanchez Harley -- RiZen is the premier artist on Sanchez Harley’s new label ChezMusique and Light Records. Harley, a legendary, award-winning producer, won two Dove Awards, has also produced three Grammy Award-winning albums and six Stellar Award-winning albums through his original production company, Chez Musical. Sanchez Harley has produced more than 80 album projects, and was a former artist and writer at Motown Records. Sanchez has worked with a list of mega-artists that include Kirk Franklin, Yolanda Adams, Hezekiah Walker, Daryl Coley, Kenny Rogers, Michael McDonald, John Hiatt, Patti Austin and numerous GMWA Mass Choir recordings. His successes in music can be found in both the secular and gospel genres for nearly every major record label in the music industry. For more information about Sanchez Harley or ChezMusique visit www.sanchezharley.com or www.chezmusique.com. Co-Producer -- The late Michael Robinson; A talented man who is sorely missed. "Your gift is embedded in every bar of this project. Your inspiration and memory keeps us, we all long to see you." - Sanchez Harley. AyRon Lewis - An up and coming Gospel music writer whose compositions are well-represented on this CD. He directly wrote 5 songs, co-wrote 3 songs; (two with sister Adriann, 1 with Myron Cobbs) and contributed to 1 song - a total of 9 songs on RiZen CD. Band Musicians... Terrance Chaney; organ. * James Hodges; bass. * Lamar Carter; drums. * Jim Long; guitar. * James Hodges; percussion. This reviewer thoroughly enjoyed and was blessed by RiZen's wonderful collection of diverse Gospel songs which will lift the listener into a mood of praise and worship of the Lord. This CD is a must for anyone's collection, whether you are new to Gospel or a veteran listener. Their love for the Lord is magnified in their vocals and unique form of Gospel music, and their musical ministry for Jesus is just getting started. They are truly "anointed by the Lord" to spread the good news that we find in Jesus Christ, and remind us that we can rely on our loving, faithful Lord who cares for us to see us through any difficulty and bless us along the way through our life. CD Dedication: This debut CD of RiZen was dedicated to "Our fallen brother, Mike Robinson, who has RiZen to be with our Father. There are no words to express the sadness in our hearts that you cannot share this moment in an earthly celebration. However, we are ecstatic that you now enjoy those "streets of Glory" every day. A strong second favorite of this reviewer. A great high energy, roof-raising praise and worship song to start the CD off with big bang of excitement. Strong, effective vocals supported by an accomplished contemporary Gospel band with a full horn section sound, which give a stirring intro, and fine support to a soul- stirring, spirit lifting song of praise which takes the focus off self and onto our magnificent Lord who loves us, cares for us and is always there on time to comfort, strengthen and guide us through all our circumstances. Song features nice subtle change in composition between the Verses and the Chorus. Verses are smoother, quieter, more melodious with nice piano, organ, guitar, soft horn accents, which encourages self-reflection worship, while the Chorus is more bouncy, lighter; snappy drums, horns join in, reflecting pure praise. As in most of these songs on this CD, the VAMP is the explanation point to the song. Nice key changes, dynamics, energy and spirited praise found in the lyrics, music, performance makes this song to be foot stomping traditional Gospel at its best. "We are the praise team at our church, so this is another Sunday morning standard for us. When we sing this song, it's as if electricity is flowing through the church, and people get excited! And that puts you in a mind and spirit to think of all He's done for you, and to lift Him up and praise Him for it." 1) Oh magnify the Lord with me. Exalt his name together. From the rising of the sun. To the setting of the same. He's worthy to be praised. You don't know like I know, What the Lord has done for me. He took me through to bring me out. Now I can shout without a doubt. Chorus. 2) Listen, He may not come when you want Him, But He's always on time. Weeping my endure for a night. But joy come in the morning light. You don't know like I know, What the Lord has done for me. He picked me up and he turned me around, Place my feet on solid ground. Chorus. VAMP: I 've come to lift Him up (4 times), I've come to clap my hands, my hands (4 times). I come to lift my hands, my hands (4 times). I come to stomp my feet, my feet (4 times). I come to shout for joy, for joy (4 times). We're gonna clap and wave our hands. We're gonna jump and shout. 'Til we lose our minds. (2 times) I come to Lift Him Up! Him up. Do you want to shout for joy? come on let's shout! I'm going to shout for I come to shout for joy, for joy (4 times). We're gonna clap and wave our hands. We're gonna jump and shout. 'Til we lose our minds. (2 times) I come to Lift Him Up! Him up. Hallelujah! Thank you Jesus. Church Gospel melded with a strong R & B influence, mixed with easy 2 beat swing and a touch of soul which is all put together in a delightful way in this song which brings home the message the importance of trusting and depending on the Lord, especially during hard times and trials that enter our lives. Vocals build nicely in intensity and volume, at full strength by the VAMP, supported nicely by an ensemble of piano, electric guitar, organ and percussion . Nice R&B guitar solo to introduce the melody, and sets the rhythm for the song. Nice background organ counter-melody. Piano work is also well done. Chorus: Trust and never doubt Him (3 times). (Lead). He will make everything all right. Yes, He will Make everything all right. Chorus VAMP - Ad lib - Trust Him, Never doubt Him. Never doubt. Never doubt Him. Trust Him. Never doubt. Trust Him. (Lead) He will make everything all right. Yes He will. Trust and never doubt Him (3 times). Make everything (3 times), all right. The favorite song of this reviewer on the CD. Organ and sing- preaching starts this song off in the introduction, doing a great job to set the song's victorious message. A traditional church "roof-raising song of worship and praise" that really cooks in enthusiasm found in the composition, driving Gospel beat, terrific vocals and back up vocals in full harmony - Expresses beautifully the hope we have in eternal life with Jesus, that at the end of our life on earth, we who belong to Jesus Christ will go home to the heavenly city to be with him and others who have passed before us, which is comforting to those who have suffered a loss of a loved one. Described as "stomping, shaking, roof-rattling Gospel." Adriann says, "We consider that the national anthem here at our church. We've been doing it for almost 10 years, sometimes for 15 or 20 minutes. I love it because it gives you an idea of what it's going to feel like when we reach heaven... the walking, talking, singing, shouting. You can almost see yourself there." 1)(Lead) I'm gonna view the holy city one of these days. You know that I'm.....(backup vocals) I'm gonna view that holy city one of these days. Hallelujah. I'm gonna view that holy city, View that holy city one of these days, one of these days. (Repeat). 2) I'm gonna sing and never get tired one of these days. You know that I'm... I'm gonna sing and never get tired one of these days. Hallelujah. I'm gonna sing and never get tired, sing and never get tired one of these days, one of these days. (Repeat). Chorus:1 One of these days (One of these days) 4x, I 'm I'm gonna view that holy city one of these days. 3)I going to walk the streets of Glory. You Know that I'm...I'm gonna walk the streets of Glory one of these days. Hallelujah. I'm gonna walk the streets of Glory, Walk the streets of Glory one of these days, one of these days. (Repeat). 4) I'm gonna shout my troubles over one of these days, You Know that I'm...Chorus: I'm gonna shout my troubles over one of these days. Hallelujah. I'm gonna shout my troubles over, Shout my troubles over, one of these days, one of these days. (Repeat). chorus 2: One of these days, One of these days,6x, I'm gonna have a talk with Jesus, tell him all about my problems, hear my faithful cry, and answer by and by. VAMP: I'm gonna view, I'm gonna view, I'm gonna view, Yes I, I'm gonna view, I'm gonna view,I'm gonna view, I'm gonna view that Holy City, shout my troubles over, sing and never get tired, walk the streets of Glory, have a little talk with Jesus, tell him about my problems, He'll hear my faithful cry, and answer by and by. I'm gonna view, I'm gonna view, I'm gonna view, I'm gonna view, I'm gonna view, I'm gonna walk, I'm gonna walk,I'm gonna walk, I'm gonna walk, I'm gonna sing, I'm gonna sing, I'm gonna shout, I'm gonna shout, I'm gonna shout, I'm gonna shout, I'm gonna walk, I'm gonna shout, I'm gonna sing, I'm gonna shout, I'm gonna walk, shout, sing, shout (10x) I'm gonna view, I'm gonna view, I'm gonna view, I'm gonna view that Holy City one of these days. A lovely, uplifting worship hymn, expressing the personal testimony of RiZen, which would inspire and bless an multi-generational audience of any denomination that enjoys contemporary music. Soft, lovely melodious introduction - acoustic guitar, keyboard/organ, which supports the spoken intro, which sets the worship mood of the hymn. Dynamics build nicely throughout the song. Chorus: You've done so much, For me not to worship. You've done so much, For me not to worship, worship, worship. Vamp: I lift my hands to worship (I lift my hands to worship). Another lovely, uplifting worship hymn that would be at home in any denomination that enjoys contemporary music. We worship You, We worship You. All of my worship, it belongs to You. I enter this temple, to bask in your presence. We worship You, We worship You. All of my worship, it belongs to You. With arms wide open (3x) Lord I worship and adore Your holy name Lord. I give my life as a sacrifice of praise. I give You my heart, my mind, my soul, my praise, my money. Lord I give You my heart, my mind my soul, my praise, my money. I am available, available, to You. A Gospel-Rock song of victory and praise, a favorite of the young and young at heart that really cooks! Features a sharp, full horn sound, impressive piano and guitar work, a driving rock beat which contributes mightily to the zing and peppiness and joy of the song, fully supporting the equally enthusiastic, well-done vocals of RiZen. The VAMP once again is the explanation point of foot-stomping spirit- raising enthusiasm permeating this song, as the rock gospel composition is in full swing, sure to get one dancing around the room, praising God for all the blessings in one's life. 2) I thank you Lord for all You've done. Because of You the victory is won. All the things you've done for me, I just can't tell it. How you set my soul free, I just can't tell it, I just can't tell it. All the things you've done for me, I just can't tell it. How you set my soul free, I just can't tell it, I just can't tell it all. * * * + I LONG TO SEE YOU - Words and Music by M. Eggerton, S. Harley, A Lewis, D. Huntsinger. Another strong favorite of this reviewer. A perfect gospel prayer hymn to listen to, when life has stressed you out. A truly lovely, inspiring love letter to the Lord, with not only moving lyrics expressing all the love in a human heart for the Lord, but also a glorious melody dynamically brought to life by the song's composition and truly inspiring vocals. Piano and strings and the vocals work together to lift the listener above the turmoil and stress, to a new spiritual level, which uplifts the spirit, soothes the soul as a peace descends upon the listener. Effective dynamics, which roll and swirl throughout the composition, reaching a peak at the VAMP. Chorus: I long to see You, to be with You. Anticipating your return to carry me, To a place that I know You have prepared. Just for me where I know that I will be free. 1) Lord I love you, From the debts of my heart. All I do is for You.. I feel your presence. I want to be just like You. I want to be where You are. Chorus. Hook: Free for eternity. To praise you for the victory. Lord I long to see You. Contemporary Gospel - with a nice blend of R & B, and Pop, with a touch of Soul, nice full harmonies, strong lead vocals. Guest vocalist, Ollie Woodson is excellent with RiZen offering fine backup. Duet between Ollie and Adriann during second half of song was very well done. 1) Cried all night long, And I feel all hope is gone. My world upside down. I'm going round and round. Trying to find peace of mind. Couldn't find love, joy happiness. In a world of sadness. Chorus 1: Where is the light that shine? Especially for you and me. There must be some help for me. 3) There is someone who sacrificed. For your sin, he gave his life. He brings joy from despair. Just read the word and stay in prayer. I want that man who was stretched so wide. Hung his head, bled & died. He didn't come down. He stayed right there, for everybody, everywhere. Chorus 2: He is the light that shines, that's going to take good care of me. He is the light that shines, Especially for you and me. Vamp: Jesus, He's gonna take good care of me (repeat). Jesus, Take care of me. Jesus, Jehovah, Provider, Healer, Take care of me (repeat). Joyous Gospel praise song that is a Urban Gospel, Hip-hop, Rock and R& B mix that will get you out of any doldrums, negativity you may be experiencing, if it doesn't get you up out of your seat, dancing around the room! Features terrific syncopated counter melody played by accomplished horns, guitars and piano, drums, keep the song cooking along. Strong, enthusiastic vocals, carry the main melody beautifully in the swing and spirit of the song. Guest vocalist - Chris McDonald does an outstanding job leading the song and the harmonies and vocals of RiZen are full of the Spirit. On the Grace of God I'm resting. Time for me to reap my blessing. Yes, I believe it, I shall receive it, I know the Lord will make a way, Not tomorrow, but today. It's my Turn. I'm standing on the promised. I know he'll do just what he said. If God is for me. Who can be against me. According to my faith, I know a blessing on the way. Chorus. The favorite Gospel hymn of this reviewer, the perfect song to end the CD, as it lifts one up in the Spirit, soothing the soul and bolsters one's faith that great Gospel music has been known to do. A powerful, dynamic traditional -contemporary Gospel hymn with a flowing melody - soaring vocals and expressive piano work, which has the encouraging message that if we stay in his word, trust in Him - Just have faith and believe that He will provide for all your needs. Song begins with just a flowing piano and a single, expressive lead vocal through the first verse up to the first singing of the chorus. As the dynamics begin to build, starting with the chorus, other instruments enter, organ, drums, guitar which provide support to the melody, rhythm and supportive counter-melodies. Full harmony in the chorus. 1) God said He'd supply all your needs, According to His riches, in glory. And He is able to do just what He said. Just acknowledge Him in all your ways. He is faithful to His word, each and every day. He has nor forgotten you so don't be dismayed. For your way may seem hard, He'll give you strength. To endure, I know His promise is sure. Oh just study His word and be true. Remember what He's done for others. He'll do the same for you, just wait on Him . And it will come to pass. Reviewed by: Julie Carr for ChristianMusic.com.